A little food. A little wine. I hosted a bridal shower the other day for my sister, and it turned out wonderful. The weather was beautiful, the food supplied by my friends was abundant, and the cake… well, let me just tell you about THAT! 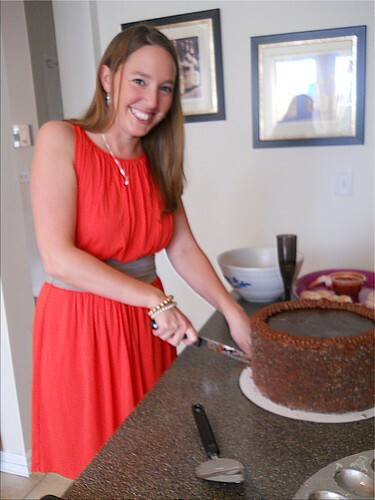 My sis had a heck of a time cutting the first slice! I was smart enough to not take the time to bake an extraordinary cake, knowing full well that I would be buying foods, some drinks, and cleaning overhauling the house. It was the best decision I made in a long time. So, of all my baking friends that I know, where did I buy a cake from? 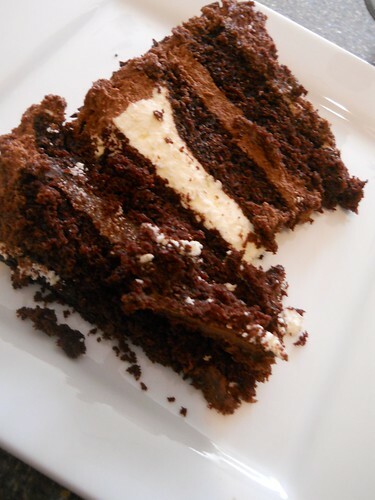 This was a no brainer to me… It’s no secret that I love chocolate, but I didn’t want standard chocolate cakes. 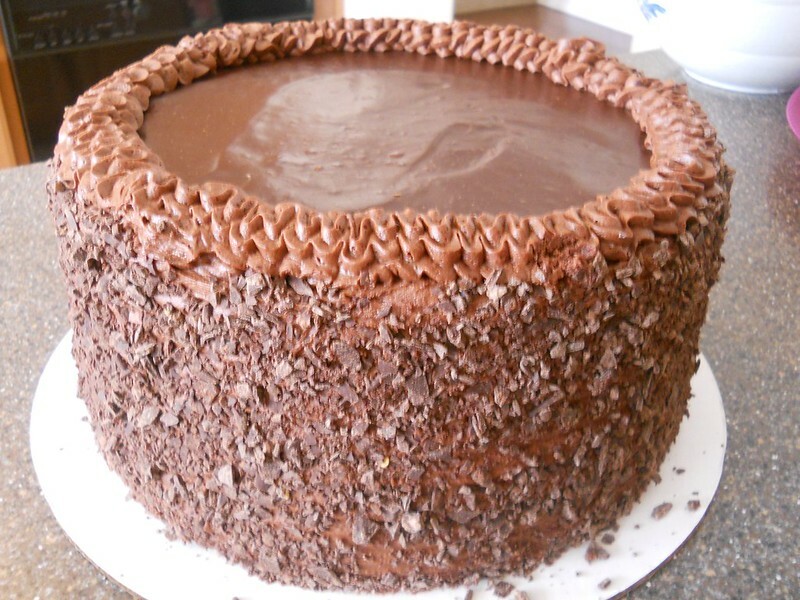 I wanted it to be from a chocolatier, and there was only one in town that makes chocolate truffle style filled cakes! Of course, my friends at The Secret Chocolatier. 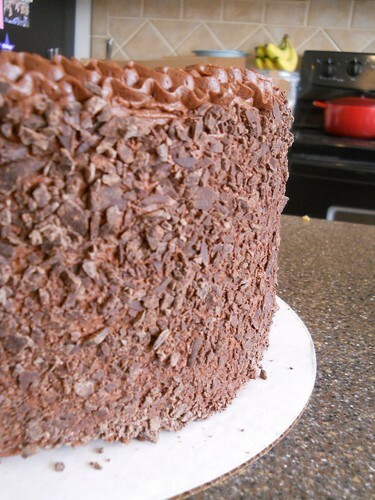 I know… a chocolatier makes CAKES?? Yes, Bill Dietz, executive pastry chef, created this beauty of a cake, though I’m guessing parts of the cake was assisted by Robin, daughter to Bill, and chief chocolatier. A gifted family working together making a masterpiece – what a beautiful story! So, that’s why I’m sharing this to you. If you have a wedding or other event to host, please consider them to create your masterpiece. You WON’T be disappointed! Thank you to the Dietz and Ciordia family for making the bridal shower end with on a magical note! Posted in Baked goods, DessertTagged 7 chocolate cake, bridal shower, Charlotte, chocolate cake, food, Secret Chocolatier, wedding, wedding cakeBookmark the permalink. The Chocolate Bottle by The Chocolate Bottle is licensed under a Creative Commons Attribution-NonCommercial-NoDerivs 3.0 Unported License. Based on a work at chocolatebottle.wordpress.com. Permissions beyond the scope of this license may be available at andrea@chocolatebottle.com. Valentine’s Day – Why Do We Celebrate?